Away from Brexit, British industries are still looking to strengthen their ties with Europe and the rest of the world. Chris Hayes, Managing Director of the British Swimming Pool Federation (BSPF), was among the representatives of 16 nations meeting at Cologne’s Aquanale event to announce the formation of a World Alliance of Pool and Spa associations (WAPSA). Meeting in November, representatives agreed to jointly form an informal working group, initially intended to consolidate data and statistics from all of the associations involved. The group is also open to the exchanging of training, development concepts and safety related issues. 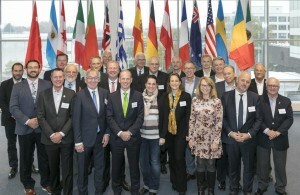 Australia, Argentina, Canada, Mexico and the USA were the key additions to the already successful EUSA (European Union of Swimming Pool and Spa Associations) at the event hosted by German Bundesverband Schwimmbad & Wellness (BSW).